Ellah Wakatama Allfrey is the new Chairperson of the Caine Prize for African Writing. 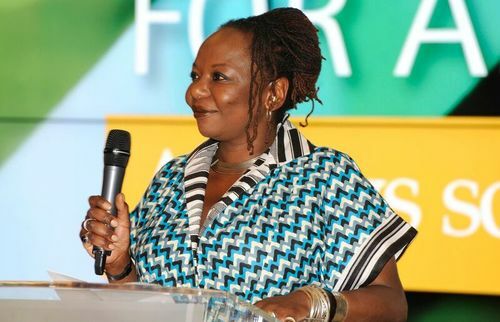 The Zimbabwe-born publisher takes over from Dr Delia Jarrett-Macauley. The Caine Prize, awarded annually for African creative writing, is named after the late Sir Michael Caine, former Chairman of Booker plc and Chairman of the Booker Prize management committee for nearly 25 years. Previous winners are Leila Aboulela (2000), Helon Habila (2001), Binyavanga Wainaina (2002), Yvonne Adhiambo Owuor (2003), Brian Chikwava (2004), Segun Afolabi (2005), Mary Watson (2006), Monica Arac de Nyeko (2007), Henrietta Rose-Innes (2008), Osondu (2009), Olufemi Terry (2010), NoViolet Bulawayo (2011), Rotimi Babatunde (2012), Tope Folarin (2013), Okwiri Oduor (2014), Namwali Serpell (2015), Lidudumalingani Mqobothi (2016), Bushra al-Fadil (2017), and Makena Onjerika (2018). Apart from the prize winners getting literary glory and a cash prize, shortlisted stories, and a few selected others are compiled into an official anthology. This is published by New Internationalist in the UK, Interlink Publishing in the USA, and a variety of international publishers around the world. On the continent, they have been co-published with ‘amaBooks (Zimbabwe), Gadsden Publishers (Zambia), FEMRITE (Uganda), Huza Press (Rwanda), Jacana Media (South Africa), Kwani? (Kenya), Mkuki na Nyota (Tanzania), Lantern Books (Nigeria), Sub-Saharan Publishers (Ghana) and Redsea Cultural Foundation (Somaliland, Somalia, Djibouti, Ethiopia, Eritrea, Sudan, South Sudan and UAE). The prize which has brought to the fore some of the household names in African writing is undergoing a change as Dr Delia Jarrett-Macauley its chair steps down from a role that she has been executing since 2016. Ellah Wakatama Allfrey is not new to those who follow the literary scenes in Africa and the UK. The publisher, critic and broadcaster, and current Trustee of the Caine Prize is the founding Publishing Director of The Indigo Press. She was a judge for the 2017 Dublin International Literary Award and the 2015 Man Booker Prize. She is former deputy editor of Granta magazine and senior editor at Jonathan Cape, Random House. She is the editor of Africa39 and Safe House: Explorations in Creative Nonfiction. Her journalism has appeared in the Telegraph, Guardian and Observer newspapers and in Spectator and The Griffith Review. She is featured in the 2019 New Daughters of Africa anthology. She is a trustee of The Royal Literary Fund and sits on the Advisory board for Art for Amnesty and the Editorial Advisory Panel of the Johannesburg Review of Books. Previous Previous post: Shadreck Chikoti, Abu Sense blow away Nairobi at Artistic Encounters 2019 opening. Next Next post: Geko Mofolo Prize for Outstanding Fiction in Sesotho 2019 judges announced.